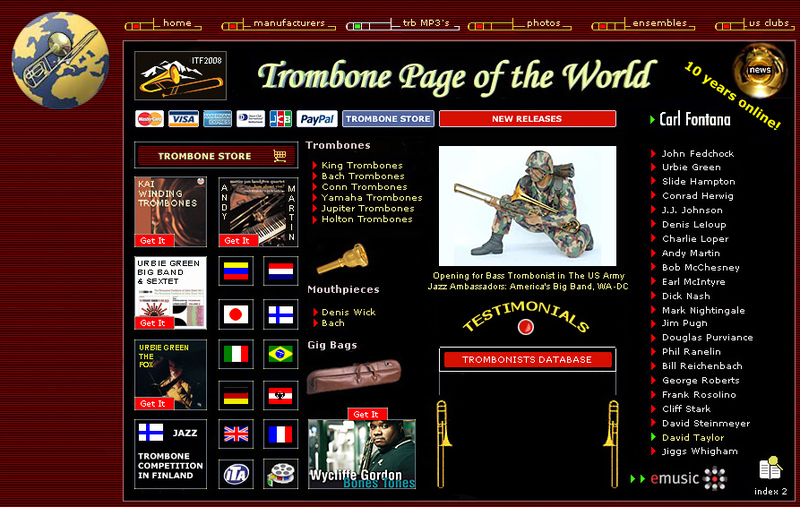 Trombone Page of the World - Rene Laanen's trombone site 10 years online! 1998 - 2008 - Most viewed trombone site! Cool free ringtones at Premieringtones.com. Billboard Chart Top20 - get your favourite Mp3 ringtones to your mobile phone. "Hi Rene, Thanks very much. I'm very honored to be listed with those great players. You've done a lot of work, it looks good." "Trombone Page of the World is the best place for the trombonist"
Great Web page and a terrific resource for trombone players around the world, I appreciate all of the help for myself and all trombonists!